KUALA LUMPUR, 20th AUGUST 2008– Canon Marketing ( Malaysia ) Sdn Bhd, a global leader in photographic and digital imaging solutions, today unveiled its new EOS 1000D which offers the power and versatility of a DSLR, with great value for money. Canon’s new addition is a force in driving down the barriers towards the adoption of high performance cameras and systems, by reducing costs, boosting capabilities, while improving ease of use. The EOS 1000D boasts sharp 10.1 megapixel images, life-like colour, a wealth of camera functions while being highly compatible with the full range of Canon lenses & Speedlites. The EOS 1000D is the best-value platform for young enthusiasts who are passionate in exploring the art and craft of professional photography. EOS 1000D can record images in JPEG modes as well as RAW format, which can either be stored in SD or SDHC memory cards. The EOS 1000D bridges the gap between an easy to use compact digicam and the high performance of a professional DSLR by offering pragmatic features that instantly elevate the level of photography available to the user. Boasting a start-up time of a mere 0.1 seconds, users can truly capture images on impulse. High quality images of life’s fleeting moments are made that much easier with its wide-area, high-speed, 7-point autofocus system, with 3 fps continuous shooting for fast-action scenes. One feature that compact digicam users miss most in a conventional DSLR is the ability to frame a shot using the camera’s LCD screen rather than the optical viewer. In most DSLRs, the LCD screen is for picture review only. Thanks to the revolutionary integration of mechanical shutter in the EOS 1000D CMOS sensor, the mechanical shutter can be kept open even while in shooting mode. Hence the EOS 1000D’s 2.5-inch LCD screen can be used in Live View mode to frame a shot just like with a compact digicam. Moreover, with the EOS 1000D connected to a computer, Live View shooting can also be effected through the computer screen instead of the LCD — especially handy in instances where focus and composition could benefit from a larger screen. The unit is also incorporated with EOS Integrated Cleaning System which uses ultrasonic vibrations to shake dust off the CMOS sensor’s low-pass filter. Together with software-based Dust Delete function, users can expect exceptionally clean images. 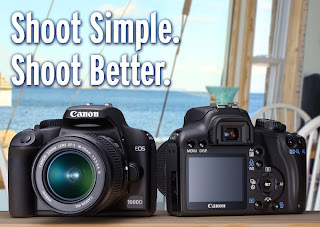 Like the rest of the Canon range, the EOS 1000D is designed with attention to ergonomics and ease of use. It is compact, lightweight, and shaped to fit the user’s hands for comfortable, natural operation, with dedicated buttons for the most important functions. These include ISO speed, Picture Style, metering mode, drive mode, AF mode and WB mode. The other numerous functions and settings available are accessible via an intuitive menu system, which can also be customised to the user’s preference. 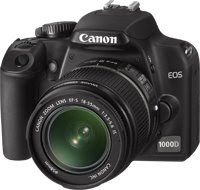 The EOS 1000D (with EFs18-55mm IS kit lens) will be available at authorized Canon Dealers from 20th August 2008 at the recommended retail price of RM 1,999.00. In conjunction with the Nation’s Independence Day, Canon will team up with Berjaya Times Square in the Merdeka Revived Campaign. Canon is set to offer irresistible promotions and gifts with the purchase of EOS 1000D to make the Merdeka day celebrations an even more memorable one. With every purchase of EOS 1000D, buyers will be given the opportunity to participate in a lucky draw at the booth. Attractive accessories for the EOS 1000D like Speedlite 430 EX II, EFS 55-250 mm IS and EF 50mm F1.8 II will be up for grabs. Also 1st 50 to register at the booth daily during the promotions will stand a chance to purchase the EOS 1000D kit for only 1000 cents (RM10nett). The units are limited to one purchase per day, so grab this opportunity as soon as possible. The booth will be situated at LG Concourse between 28th Aug 08 till 31st Aug 08 from 10am till 10pm. Don’t miss the opportunity to get Canon’s new addition EOS 1000D and capture life’s moments in high quality.